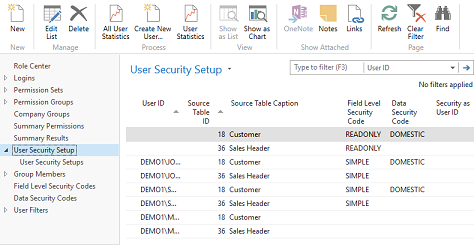 When regular security based on data and objects in Microsoft Dynamics NAV (formerly known as Navision) is not enough, Field Level, Actions and Data Security (FLADS) can add extra capabilities like hiding fields, making actions impossible to click or showing only some records based on filters. The example below show the Sales Order with most actions disabled, The Post action removed, and only a few editable fields, all dynamically controlled from Field Level, Actions and Data Security. There are many small details involved in the setup. FLADS allows a simple way to specify only a default and only the details that are different. 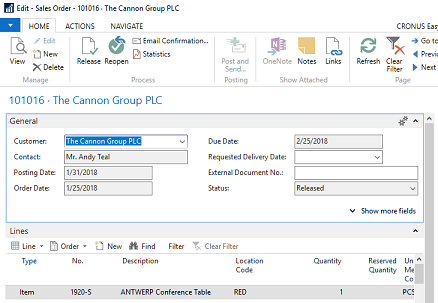 In a page like the Sales Order this can amount to 10 fields and controls (actions) being specified and the remaining being used as the default. The screen shot below shows how this is done. The same concept applies to users and objects. This allows for creating a default that is very restrictive and then only opens up for objects that require extra access. Below is an example with a Sales Header (Sales Quote, Order, Invoice, Credit Memo etc.) where every page is viewable except the Sales Quote and Sales Order, which require additional setup. In this example, Sales Statistics are not shown. Assigning rights to users uses the same concept to minimize the amount of setup. The example below shows that the “BLANK” user has restrictions with permissions and DIANA and the other users having fewer restrictions. The user SUSAN does not need to be maintained manually since she uses the same setup as DIANA. It is often necessary to give access to important information like the customer card to many people in the company for maintaining address information or other similar simple issues. But Credit Limit and posting information should not be changed. With Field Level Security, fields can be controlled in pages and forms to Edit, View and Hide. When a field is “View” the user can see the value, but not edit the content of the field. With “Hide” the field is completely gone and cannot be shown on the page or form. Many actions like Shipments or Invoices do not require any special permissions to be used but other like Release or Post on a Sales Order should only be accessible by a few users. Actions can be Edit, View or Hide. With View the action is shown on the page, but is grayed out and cannot be clicked. Hide completely removes the actions so the user has a much simpler screen to deal with. Each individual action can be controlled, allowing a warehouse employee, for example, to use the “Post and Print” on a sales order, but no other actions. The other Actions can also be completely hidden so there is less confusion about what needs to be done on the page. With the classic client it is not possible to control the individual menu items but only the complete button. This still allows for a high level of control of what the users are able to do. It is technically not possible to control individual actions like in the RoleTailored Client. In a large organization tasks will be divided between several people, which often means that information for other parts of the organization should not be visible to everyone. With Data Security, Sales Orders can be limited to certain posting groups, countries, states or any other field, for example. The example below show that only Sales Headers with the Customer Posting Group DOMESTIC is shown. When a filter on the Status is added but is Editable, the user can remove it. The Filter on Customer Posting Group is Hidden and cannot be seen or removed by the user. Field Level, Actions and Data Security consists of only new objects and require no merging when installed in a database. An install engine is included and can be run by a customer with module 7200 (Application Designer) or by the partner. Field Level, Actions and Data Security is possible because of customizations added to the objects in the database. Only pages and forms are modified. By simply selecting the tables that FLADS needs to be installed for will the install engine automatically do the necessary code changes when the installation engine is run and the objects imported and compiled. The screenshot below shows the required information for the Source Table. With customization in the code upgrades can be harder, but FLADS is able to remove all the changes from the source code, even after many manual modifications have been performed following the installation. This also ensures that the code for FLADS can be updated easily when upgrading from one version of Microsoft Dynamics NAV to the latest. United Subcontractors received the objects for Field Level, Actions and Data Security on a Wednesday and by Friday had record level security up and working in a testing environment. Because the install process is very straightforward, rolling it into the live database was fast and simple. “Mergetool.com has done a great job developing an application that stands on its own and doesn’t interfere with other NAV functionality—I love that kind of programming elegance." Modules and pricing for NAV Easy Security. 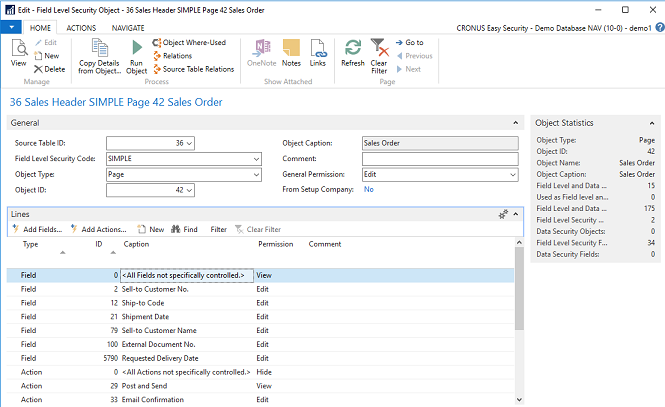 The Easy Security must be purchased through your NAV partner as other modules for Dynamics NAV. Please contact us for pricing for multiple NAV licenses. Please contact EasySecurity@mergetool.com for a demo version, to get the current version of the source code or a detailed pricelist for NAV partners.